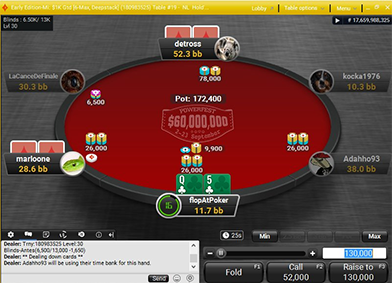 PartyPoker has introduced a new update recently, and with it - a new features for players. Amongst those there is a log awaited option to show stacks in big blinds rather then cash or tournament chips! In the newest entry at PartyPoker blog Patrick Leonard has taken a detailed look at the changes announced by the operator, that mostly focused on the table display and visual aspects. Leonard mentions he has worked hard on the modifications and chekced all the changes in practice. He even took part in an event that he would normally skip, because he wanted to test a thing or two. What was the effect? He won it and scooped $20,000! Stacks defined in big blinds – awaited solution finally here! Apart from the things you can read about above we also have the option of showing the stack in stack big blinds (both yours and your opponents'). Till now it was possible to achoeve only via the help of PartyCaption. If you want to test the new option you can do it manually and if it is to your liking you can go to “table options” and chose the standard you prefer. Another update is to allow the same for bets which will surely be useful.